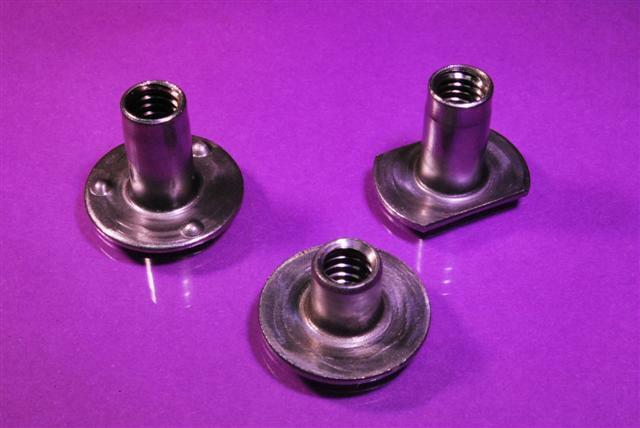 Stamped flange weld nuts are specifically designed to be welded onto another metal surface into properly sized holes. The specialized round and slab base flange weld nut design helps overcome many problems associated with other welded nuts. This helps to prevent burnout-outs when used in thin sheets. Engineered projections also help keep the nut from warping when welding with high current. A round head design eliminates tedious time-consuming indexing, while increasing production using standard equipment. Additionally, the compact design of the round head provides an ideal fit for narrow flanges. Stamped flange weld nuts can self-locate depending on the intended application, as when the barrel portion of the weld nut is inserted through a hole. The self-locating feature is beneficial because it properly positions the weld nut prior to welding. Additionally, the self-locating feature also protects the threads from weld spatter. Contact us for more information on our stamped flange weld nuts, or contact us today at 1-800-783-0910 with any questions you may have.